The amount of people in Austria increases each year about 20.000 people; hence there is a need for more space. But without a mobility-change the cities would drown in traffic in the coming future. Place can be better used, because of the increasing requirement of space-saving and climate-friendly mobility. This leads to a transformation of the streets to enhance the quality of life. Because of the car-orientated city planning many areas of public spaces are used as mono-functional traffic areas. Furthermore, streets and parking lots need a lot of space that could be used differently and better. In Austria’s capital cities some traffic areas take twice as much space than building areas, in some cities even four times more. Since several years many cities are working to transform public spaces back to a place of encounter. This strengthens the local economy in small towns and cities. In addition, a comprehensive mobility-rehabilitation can strongly increase the quality of life in cities. A focus lays on the public transport, walking and cycling. Many European cities show a decrease of the level of car-motorization, furthermore, in some cities in Austria – for example Graz, Vienna and Innsbruck – there is a decrease of cars per 1.000 persons. 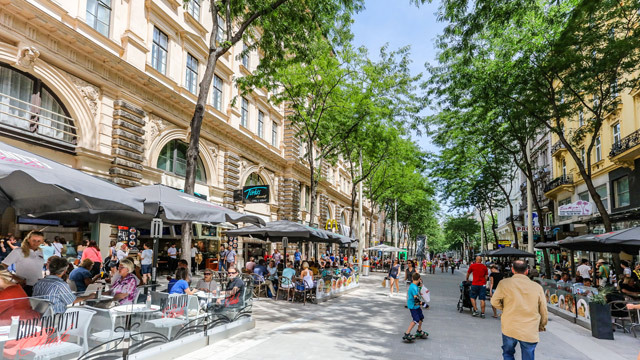 To live near to a heavily used street is uncomfortable, unhealthy and is perceived as a burden, therefore the majority of Austrian drivers agree that traffic-calming in cities is positive. To enhance the quality of life, the already started change in mobility types into environmentally-friendly and space-saving mobility options needs to be accelerated. It is important that space-efficient means of transport are prioritised, because one tram is able to transport the same amount of passengers as 124 cars. Therefore, environmentally-friendly and space-saving mobility creates big advantages and also good conditions for cities, also because more densely populated neighbourhoods allow a more cost-efficient and better development of public transports. In many cities it is a big advantage that citizens have the possibility to be mobile without a car. Especially in Vienna, Graz, Innsbruck, Bregenz, Salzburg and Linz the majority of daily routes are covered by foot, bike or public transport means. A survey from 2014, from Generali Versicherung showed that two thirds of Austria’s population want and support traffic-calming. The quality of stay in public places and on streets can strongly improve through a mobility-rehabilitation. The design is based on the human social behaviour. Because of the collective use of public spaces there is a higher attention, the speed gets reduced and the tolerance enhances. Therefore, Shared Spaces and encounter-zones work mostly without traffic signs. In zones with calmed traffic there is also no need for many traffic lights, this leads to a big cost-reduction and also has positive impacts on the behaviour of drivers. Because of traffic-calming and mobility-rehabilitation shops and cafés on the ground level become more attractive. Also other spaces on the ground level gain back attraction to meet and relax. Furthermore, if those places get used as neighbourhood-centres or as collectively-used areas, a local supply within walking distance is possible. If more people walk in a street there will be an increase of the quality of life. If cities plant more trees and lawns it will also positively affect the environment. Trees create shade in the summer, clean the air from pollutants and improve the quality of air. Moreover, plants also have a positive effect on lowering the heat in a street. Because of an extension of the U2 in Vienna it was possible to increase the modal split of public transport about 6% in one year. In France, they used the expansion of the tram-system to embellish the districts and as an accent for the city. Next to the tram-lines there is mostly lawn and they planted about 1000 trees. Because trams are more comfortable than busses, Munich changed on route from bus to tram and gained 57% more passengers.